Silver from the silver mines (metallon) of Lavrio (or Lavrion or Laurion) was the source of wealth and power of ancient Athens. The playwright Aeschylus called Lavrion the "treasure house of the country" & in Persai: 'a well of silver' [472 BC] . General Themistocles used the silver to build a wall around the city of Athens (which extended down to Piraeus) to keep out the Spartans. He also used it to build a fleet of about 310 ships (Triremes) which were used to defeat the Persian fleet of 500-600 warships at the battle of the island of Salamis in 480 BC. With the defeat of the Persians, the Greeks entered their "Golden Age" (461-431 BC) which changed the course of history. Later, the Athenians finally lost the Peloponnesian wars against the Spartans because the Spartans (in 413 BC), instead of returning home for the winter months, camped at their fortress (Dekelia or Δεκέλεια) on the lower slopes of Mount Parnitha, North of Athens (38°11'03.26"N, 23°47'07.89"E) and blocked the supply of silver to the city - thus causing a chronic shortage of money in Athens. The silver-bearing ores had been exploited since the Bronze Age. In 482 BC the discovery of an especially rich silver vein led to a massive increase in mining activity. At it's peak, 350 mines produced 1000 talents (1 Greek talent = 82.5 lbs. or 37.5 kilos) of silver a year worked by 10-20,000 slaves. The 'industrial slaves' were prisoners of war & mostly barbarians who were purchased for a low price. Their life expectancy was short and they worked in conditions of indescribable squalor. The mines were worked 24 hours a day, 7 days a week and from the discovery of miners lamps containing oil, the slave's shifts have been estimated at 10 hours straight. The slaves had no vacations! The city-state of Athens maintained strict control over the purity of the silver produced in Lavrio and minted the famous "owls" silver coins designed for wide circulation. Because of the purity, the coins were accepted far and wide and gave the ancient Athenians much 'buying power'. Note: The vertical Alpha Theta Epsilon - abbreviation for Athens. 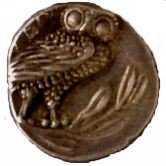 Another ancient Athenian silver coin with an owl relief. In total, the mines were exploited for their silver-bearing ores for 25 centuries. Over 2000 mines have been recorded in the hills around Lavrio. The main ancient mining activities took place in an area known as Agrileza - not far from the village of Kamariza (now called Agios Konstadinos). The ancient workshops (ergasterion) near Souriza's Valley and the Agrileza Valley and round the base of Michalis Mountain are now protected within the Sounio National Park.